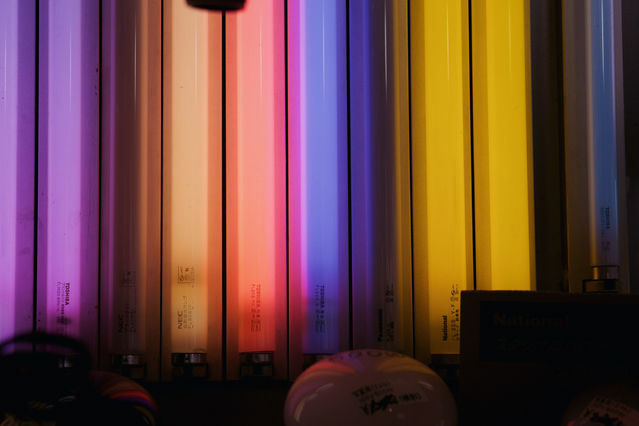 Display of 20W color options for fluorescent tubes. A nice picture for use as wallpaper! Can I use as wallpaper? Is that NEC "IF" Incandescent Fluorescent? Yup! Shame they won't fit in American fixtures. Especially since they can custom order colors, tints and coatings apparently too. I got a tri-color Pink / Blue / Green (10W) but they can be order up to 40W. You need to post a pic of that tri color!!! I have a couple Japanese FL10 fixtures with screw in starters, they seem to work fine even though they're rated at 100v. It'd be neat to have unusual colored tubes for them!